This is my great pleasure to express that I have written a book on iReport 3.7 which is published from PACKT PUBLISHING, UK. Please view details here. Produce summary data and present them in a dynamic crosstab report. Although JasperReports is the world's most popular open source Java reporting library, it doesn't provide a tool to visually design reports. 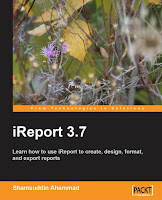 iReport is a visual report designer built on JasperReports that fills that lack. It is an intuitive and easy-to-use visual report builder/designer for JasperReports, written in 100% pure Java. Creating JDBC connections from iReport to connect to different data sources.